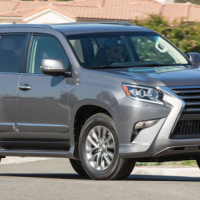 The Lexus GX460 is the ugliest car on sale today. There, I said it. I said it so you didn’t have to. You were thinking it, of course. But you were afraid to say it, largely because you were worried that an angry Lexus GX460 would come after you and use its enormous front grille to gnaw on your family. Now, before I go any further, I’d just like to say that I generally try to avoid discussing automotive styling. This is because automotive styling is highly subjective, which means that talking about it can really piss people off. For example: a lot of people really like the original Oldsmobile Aurora, whereas I always felt it looked like the kind of thing you might draw if you were holding a pen with your toes. But you can’t say this kind of thing to Oldsmobile Aurora owners, because it will cause them to fly into a rage, and then they’ll take even longer to write out checks when you’re standing in line at the grocery store. I also try to avoid discussing automotive styling because my opinions tend to go against the mainstream. For instance: I really like the Ferrari FF. Seriously. I think it’s handsome, and bold, and muscular, and well-proportioned. This is in direct contrast to, say, you, who probably feels that the Ferrari FF looks like the kind of thing that even the Japanese would be embarrassed to display at the Tokyo Motor Show. So styling is a bit of a sore subject, and I try to steer clear of it whenever possible. But I’ve decided to break my silence today, this one time only, to address something that really needs to be discussed: the corporate grille. Before I get into the GX460 situation, I’d like to start with a little history lesson on the corporate grille. Founded just a few short years ago, it offers American food and a large selection of wine, beer, and liquor, along with several high-definition TVs that ensure you’ll never miss a big game. The history of the automotive corporate grille is much different, and I think we can all agree that no matter how I explain it, several commenters will point out that I got it wrong. So I will instead settle for a quick definition: the corporate grille is what happens when a car company decides that each of its vehicles must have the same front end, regardless of a car’s size, shape, market position, or the fact that slapping on such a grille might make the car look like an indignant microwave. But there have been many occasions where the corporate grille has done more harm than good. I am thinking here of that time Subaru tried to install a giant circle with two wings on the front of each of its cars, in spite of clear opposition from those of us with eyes. Or the time that Mazda gave all of its cars an enormous grin, which – in states with two license plates – included one large, center-mounted aluminum tooth. Before I tear into the spindle and suggest that we will someday look back on it as the beginning of the downfall of civilization as we know it, I would like to point out that I actually like the spindle. It looks excellent, for example, on the GS and IS. Disagree if you want, but I think these cars are gorgeous. And I’m certain of this viewpoint because I saw these vehicles in person several months ago on an all-expense-paid Lexus press trip. But here’s the thing: the GS and IS are sedans. The grille works perfectly on those cars because it gives them this sporty, edgy look, as if to say: “I’m the first Lexus you can drive without prescription bifocals!” They look cool. They look exciting. They look fun. But the GX460 isn’t a sedan. Instead, it’s a large, ungainly SUV now fitted with what I wouldn’t describe as a spindle, but rather an Angry Hourglass. In fact, I think that’s what I’ll call it. The Angry Hourglass. The major problem here is that the GX460 wasn’t designed with this grille. The current model came out in 2010, and back then it featured a normal grille, like every other Lexus. But then Lexus decided that it must update every one of its vehicles to include the Angry Hourglass, so they facelifted it. The result is an SUV that’s 90 percent normal, staid, suburban child transport vehicle, and 10 percent angry 1990s video game boss. And that brings me to my point. Automakers: you don’t need a corporate grille. The GX460 was doing just fine before they tacked on the Angry Hourglass. And Subaru seems to be doing great, despite giving up on that bizarre circle thing. I think we can all agree that this proves a corporate grille is less effective than, say, a bunch of TV ads that show young people kayaking. The simple truth is this: just because it looks good on one model, or two models, or even five models, doesn’t mean it looks good on the entire lineup. 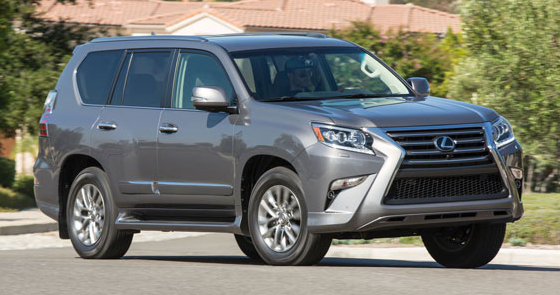 The Lexus GX460 is proof. And now, here I sit, awaiting death at the hands of the Angry Hourglass. I couldn’t agree with you more! The GX has always been a bit ‘wonky’ looking, but forcing that ugly corporate ‘face’ on it ups the hideous factor to a whole new level! Who would pay $60k+ for something that looks like that, struggles to get 15mpg and is so heavy that 301hp is barely sufficient to move it!?!? You’d think that Acura’s colossal screw-up back in 2009 would serve as a lesson to the rest of the industry about why a corporate ‘face’ or grille is such a bad idea. Overnight, one of the best looking cars on the market (2008 TL) was transformed into something so hideous that it defies description (2009 TL)! The ‘Plenum Power’ grille made the TSX far less attractive and eventually ruined the snouts of the RDX and MDX, too. Acura went from being my favorite among the premium/luxury brands to the one I despised. My 2012 Mazda CX-9 is another example, though not nearly as severe as Acura or Lexus. But in 2010, the original CX-9 fascia (which was the best looking to date) was replaced with the “goofy grin” that plagued the Mazda3 and the rest of the lineup. It wasn’t enough to deter me from buying it and the 2013 facelift is even worse, but I would never describe the snout of my 2012 as being good looking, either. The Lexus in question looks like the designers tried to appeal to the Space Invaders demographic for their grill design, thereby reminding 60 year old boomers of many hours of idle time lying on the living room orange shag carpet madly getting past the eighth level. The remainder of the SUV is elephantinely bland with acres of slab sided pachyderm panels; but that indented grill does not pair with the remainder of the vehicle. At least people are not complaining about Lexus being bland and boring, now they are odd and ugly. I remember when BMW came out with their large rear end, a BMW designer said it was better to have people hate your design rather than have no reaction. Well, people sure are reacting strongly to Lexus’s design, perhaps for the first time in history? I would guess it gets toned down in the next redesign, just as BMW and Mercedes have done. I like the idea of a corporate grill as it brings a brand together. But what bugs the hell out of me is when they slap a new grill design on a body it was not designed for. Toyota/Lexus have been doing a fair amount of this recently, and I really wish they would stop. Keep up the great writing Doug. Thanks for pointing this out Doug, I had never seen one of these before and now my brain is seared with this ugliness. That is just horrific. I agree that the spindle grille works very well on the IS, and I suspect that it could have worked well here, too, if only the design project had not been given to an untalented relative of Lexus’s Engineering Director. Well, the Ssangyong Stavic (OG) has been pipped by this beast. But, take a good look at the whole offering from Toyota, constipated rear ends, generally unattractive as a whole, from Cruiser, Prado to Corolla. Seems the unemployed Korean designers have gone to Toyota. The sooner people stop buying these Lexus things the better as I’m sick of people saying how nice it is when they are considering a new Audi etc. It’s a stinking over priced Toyota – get over it!! !